2. If you've seen the series beforehand, please don't ruin the fun for others and spoil the story Discussion of such material is not prohibited but please exercise caution in posting. If you really wish to discuss material further along than what we've watched, please put bountiful and large spoiler warnings. Replies to spoiler-y material should also have spoiler warnings. So yeah, 6 total episodes(despite it saying 10-14, there are actually 6 episodes in that grouping, because there is an episode 12.5 that, while not important to the plot at all, is still highly entertaining to see). That's a lot of stuff to go over, especially as we transition between story arcs in this series. We learn a lot about the Dollars during episodes 10-12. Particularly things like just how big the group is, how wide the different views of the group are, who amongst our cast of characters are members of it, and perhaps most importantly of all, who the leader of the Dollars are. I was genuinely surprised to see so many members of the cast be confirmed as members of the Dollars. In fact there are very few of the characters who aren't. Even characters who are enemies are members of the Dollars, such as Shizuo and Izaya, even those douchebag ganguro girls who bully Anri a lot. However, my surprise at that was eclipsed by the revelation that Mikado, meek, up to this point utterly useless and powerless compared to Celty, Shizuo, and Izaya Mikado, was the ringleader to the Dollars. And yet, even that bombshell revelation wasn't the thing I remembered most about Episode 11. No, the thing I remember the most is Celty's epic rant as she road down the side of a building and kicked the collective asses of Namie's goons below. All the while speaking to everyone in earshot without the use of her phone. Then there is Episode 12 where we learn the truth about Celty's head. But with that truth also comes the death of my theory that they put Celty's head on Mika's body. Turns out Mika wasn't killed, just severely injured and disfigured from having her head bashed in, and instead gets plastic surgery to look exactly like Celty's head. So where is Celty's real head? Well it was still in Namie's hands, but the resident master troll of the series Izaya takes the head for himself and decides to hide it right under Celty's nose. His line of thought being she wouldn't expect to find it in the Dollars, the organization she's part of. With that we end the first arc to the series as the truths about the Dollars and Celty's head are laid out in the open. But before we move onto the start of the next arc, we take a brief break with Episode 12.5, a rather comedic filler episode following most of the cast that involve mixing up three bags that look exactly the same, and in an odd way tells its story backwards, as the episode goes further back in time as it progresses before finally starting right before the beginning of the episode. It doesn't do much for the plot beyond introducing the character Kinnosuke Kuzuhara. Episode 13 gives us some much needed insight into Anri, and shows that she is a really damaged person that depends on others a lot to the point where she can't tell the difference between love and friendship. We also get Shinra's father brought into the main cast, last time we saw him he was carving up Celty in the past. And boy is he weird.....but beyond that, the aforementioned Kuzuhara makes his presence known as he leads a task force of police officers to chase down and corner Celty and Celty's usual scare tactics don't work on his task force. In fact the opposite actually happens. They manage to scare Celty! This was actually a pretty powerful scene to me. To see Celty, who at this point made damn near everyone crap their pants when they encountered her, break down and violently shake in Shinra's arms was just stunning to see. The so called "monster" could feel fear herself. And this is beyond the lingering fear she constantly felt in regards to her own mortality. On top of all of this, the episode brings back our good old friend the Slasher, who appears to be the main focus of this arc. And lastly there is Episode 14 where there isn't too much to talk about. We get some more info on the Slasher, more specifically the relationship between the online handle the Slasher uses and a cursed blade, probably the same blade the Slasher uses. But overall the main theme of this episode was love, as we see Kida finally see the girl he appears to like, Saki, and we see Shinra's and Celty's relationship grow much stronger, and honestly more adorable. Seriously, look at that. Celty turning her ethereal black smoke into a heart shape multiple times was just flat out cute! All in all, these were a strong collection of episodes. Easily the strongest chunk I've seen yet. Though I'm sure there are plenty of good episodes to come, too. Also we got a new opening and ending! I really like the new opening for the sheer fact that it will make things much, much easier when it comes to remembering all of the names of this insanely large cast that will continue to grow larger, I'm sure. So that's all I have for this week, feel free to drop your own thoughts below. 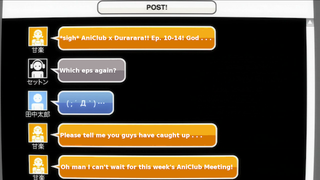 Please don't forget to watch episodes 15-19 for next week's meeting!